In recognition and memory…. – Journey to my heart…. We are different people and Len’s life and death have changed us…. I am aware that there are moments in a day or week that cause me to pause and remember…. We received an email yesterday with the attached article and picture. It is meaningful to know Len will be remembered by his co-workers who he journeyed along side every day. A plaque honoring Len Borgdorff soon will be installed on the wall just outside the South Reactor Feed Pump room in the Turbine Building. Borgdorff, a former Maintenance superintendent, died during a vehicle accident on Interstate 70 in Ohio on a trip back to Michigan. He had traveled to North Carolina to visit the Siemens facility as part of work being done to repair the South Reactor Feed Pump turbine. 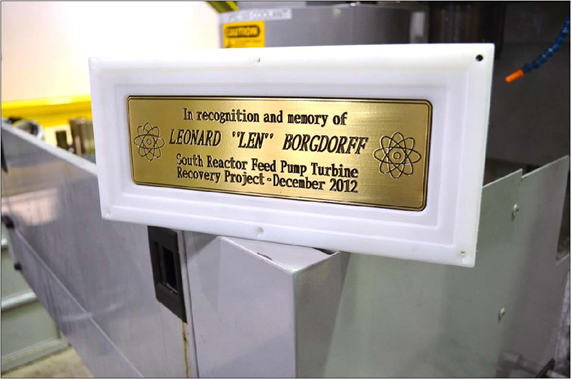 the plaque honors his work, and reads: “In recognition and memory of Leonard ‘Len’ Borgdorff South Reactor Feed Pump Turbine Recovery Project – December 2012.” On each end of the plaque is a symbol of an atom. Don Soule, a Maintenance mechanical journeyman, fabricated the plaque from a piece of brass. Soule said he didn’t know Borgdorff closely, but knew he wore many hats at Fermi 2, including as the Foreign Material Exclusion and lifting and rigging coordinator. Soule said he visited the funeral home the evening before Borgdorff’s service and learned much more about his colleague. Soule often makes plaques for retiring co-workers, but took special consideration when making the memorial for Borgdorff. I approached it with a lot of care, to make sure it would be fitting for Len,” he said. “I felt honored to be given the opportunity to fabricate it.” Borgdorff enlisted in the U.S. Navy in 1982 and attended the Naval Academy in 1983, with recommendations from Congressman Harold Sawyer and Senator Carl Levin. He graduated from the academy in 1987. He served on submarines during his career, retiring as a Commander in 2009. Borgdorff “loved to hunt crayfish and play with his children and 17 nieces and nephews,” according to an obituary. He was married for 18 years to his wife, Marcia, and had four children, Olivia, Sonta, Noah and Jean Marc. Thank you for sharing this, Trish. It is definitely a tribute even though it does n’t take away the pain…. Previous Previous post: Grief and loss…. Next Next post: Living well….